Following back-to-back 9-7 seasons in 1978 and ’79, the Oakland Raiders made changes for 1980, most notably dealing QB Ken Stabler to the Houston Oilers for QB Dan Pastorini. While younger than “The Snake”, Pastorini was not nearly as accomplished and in the first four weeks of the year he threw eight interceptions as opposed to five touchdown passes and his yardage totals steadily decreased. The once-mighty Raiders, coached by Tom Flores, were 2-2 and viewed as a team in decline. On October 5 the Raiders hosted the Kansas City Chiefs, a club they had beaten in the opening game. Kansas City was 0-4 under Head Coach Marv Levy and had been struggling with injuries to the offensive line. However, the defense came alive at the Oakland-Alameda County Coliseum to spur a 31-point explosion in the first half. In the first quarter, Pastorini had fumbled when sacked by DE Dave Lindstrom and LB Gary Spani recovered and ran 16 yards for a touchdown. Two minutes later, Pastorini was hit after throwing a pass and suffered a fractured tibia plus damaged cartilage in his knee. He was done for the year. Into the game came backup QB Jim Plunkett, a once-highly regarded prospect whose pro career had gone badly off course. The 1970 Heisman Trophy winner at Stanford had been the first overall pick of the ’71 NFL draft by the New England Patriots and had initially displayed great promise. At 6’3” and 220 pounds, he had ideal size plus a strong arm. But by 1975 he had taken a beating with a mediocre team and lost his starting job to the more mobile Steve Grogan. Dealt to San Francisco, Plunkett seemed to revive his career during the first half of the ’76 season, but again the team was not strong, collapsed during the second half, and sank further in 1977. He was let go by the 49ers during the ’78 preseason and signed by the Raiders, seeing no action during that first year and tossing just 15 passes in 1979. Frustrated after the club turned to Pastorini (and after not gaining the starting job even though he was the better quarterback during the preseason), Plunkett was very much an afterthought in Oakland – until the newcomer went down. It was a tough initiation for Plunkett against the Chiefs, as he was forced immediately to play catch-up. He went to the air 52 times and completed just 20 for 238 yards, tossing two fourth quarter touchdown passes but also five interceptions. The Chiefs also recovered three Oakland fumbles, ran up six sacks, and scored two defensive touchdowns in all as they held on for a thumping 31-17 win. It got better for Plunkett and the Raiders in the ensuing weeks. Plunkett tossed five touchdown passes in the next two games and, after getting off to the 2-3 start, Oakland won six straight and 9 of 11 contests to close out the regular season. To be sure, the tough defense that featured All-Pros in LB Ted Hendricks and CB Lester Hayes had a great deal to do with the surge. Rookie LB Matt Millen moved into the starting lineup and played above expectations. Castoffs like DE John Matuszak, LB Rod Martin, CB Dwayne O’Steen, and FS Burgess Owens all contributed. On offense, WR Bob Chandler came back from a knee injury to catch 49 passes for 786 yards and 10 touchdowns and 32-year-old TE Raymond Chester performed well all-around and contributed 28 pass receptions. But Plunkett played well and was the biggest comeback story, throwing for 2299 yards and 18 touchdowns. The Raiders finished second in the AFC West with an 11-5 record and qualified for the postseason as a Wild Card. After handily beating the Houston Oilers (and Stabler) in the first round, they just got by the Browns on a frigid day in Cleveland that came down to an interception in the end zone and then defeated the division-rival Chargers for the AFC Championship. The crowning achievement was a dominating 27-10 win over the Philadelphia Eagles in the Super Bowl. It was the first time a Wild Card team had reached the pinnacle. Plunkett’s postseason numbers were 49 completions in 92 attempts (53.3 %) for 839 yards with seven touchdowns against three interceptions. He was at his best in the biggest game, completing 61.9 percent of his passes for 261 yards with three TDs and no interceptions in earning Super Bowl MVP honors. It was a stunning turnaround for the quarterback who had seemed all-but-forgotten when the season began. 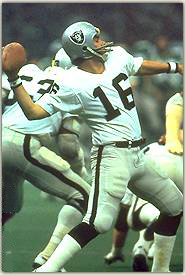 Plunkett lasted another six years with the Raiders, who moved to Los Angeles in 1982. Things did not always go so well as in ’80 as his performances were sometimes uneven and he had difficulty holding the starting job. But he did lead the Raiders to another Super Bowl victory following the 1983 season, which certainly added luster to his career.